If your garage is ready for an upgrade, look no further than Custom Garage Works! 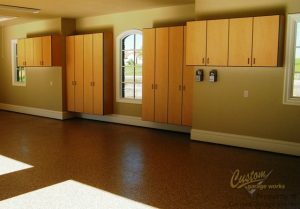 Known for our custom garage floor coating in Krum, TX, we first began our business in 2003. While we were unable to locate the services we wanted within the industry, we didn’t let that stop us, but instead, we decided to join the industry ourselves. Now, we provide some of the greatest garage storage cabinets in the industry, as well as top quality polyurea polyaspartic floor coatings that last decades longer than traditional epoxy floor coating. Our team of professionals is committed to providing DFW with premium garage solutions and garage floor coating. 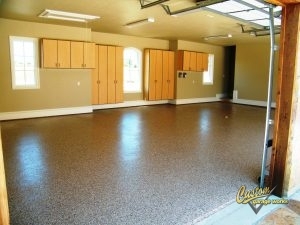 One of our most common garage options is our garage floor coating in Krum, TX. This coating is so popular because it is both more resilient, and cures quicker than traditional epoxy. Thanks to the tough composition, our polyurea-based floor coating is resistant to yellowing and flaking that can occur with epoxy. In addition to our floor preparation, which includes professional diamond grinding, as opposed to acid etching, the end result is a showroom quality floor that is easy to clean, and practically indestructible. To schedule your free estimate, and to discover more about our garage floor coating services, call us at 214-494-9068 or 817-308-1305! As for storage, you’ll never have to wade through piles of clutter in your garage again when you choose a storage solution from Custom Garage Works. The greatest custom garages have an organization method in place. With options such as garage cabinets and overhead storage racks, we have a variety of solutions for our clients’ garage organization needs. Unlike other business, our storage racks are designed for heavy duty storage, and our garage cabinets are designed specifically for use in garages. At Custom Garage Works, we are committed to installing the optimal garage floor coating in Krum, TX, and designing the most efficient organization solution for our clients, and we look forward to serving you soon! Storage Cabinets These bulldog cabinets are different from any other garage cabinets you will find in this area, thanks to their superior durability. Car Lifts A residential garage car lift is simpler to use than you might think! And More! We offer a wide selection of garage organization resolutions to our clients, to provide the optimal custom garage!